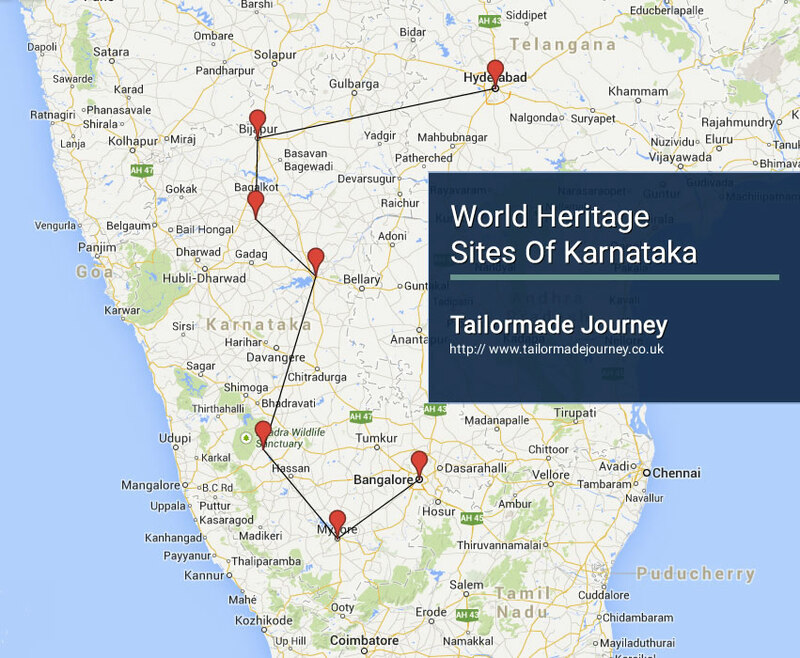 A trip to Karnataka and in this tour we visit the World Heritage Sites of Hampi , Badami Belur and Halebid. I tour that reflects the Heritage of India. Arrive Leave Bangalore > Drive Mysore 2 Nights > Drive Chikmagalur 2 Nights ( Excursion Belur& Halebid ) > Drive Hospet 2 Nights ( Excursion Hampi ) > Drive Badami 1 Night > Drive Bijapur 1 Night > Drive Hyderabad 2 Nights ( Charminar ) & Leave. Upon arrival in Bangalore International Airport you are met by our Representative and leave by Private Vehicle for Mysore. Upon arrival in Mysore check in at your pre booked Hotel. Morning city tour of Mysore, Mysore is known as a the “City Of Palaces” as there are about 17 Palaces in the city – the Maharaja’s City Palace being one of the largest in the country. Today’s city tour include the zoological gardens, the Chamundi Temple, handicraft Centre and 22 Kms away – the Brindavan Gardens which is adjoining a dam and has lot of fountains which are a sight by day and night. After breakfast leave by Private Vehicle for Chikmagalur. Enroute visit to Shravanabelagola – is an important Jain Pilgrim centre, where you can visit the 57 Foot tall statue of Lord Bahubali Gomateshwara.Upon arrival in Chikmagalur check in at your pre booked Hotel. Overnight stay at the Hotel in Chikmagalur. Morning proceed for the visit to Belur and Halebid – Chennakesava temple at Belur has a stunning visual of the maiden carved in stone, Hoysaleshwara Temple in Halebid have depictions of Hindu mythology on its walls, and Kedareshwara Temple. After breakfast leave by Private Vehicle for Hospet. Upon arrival in Hospet check in at your pre booked Hotel.Hospet is a city in Bellary District in Northern Karnataka. Hospet was built by Krishna Devaraya, the Great King of Vijayanagara in Memory of his mother Nagalambika. Overnight stay at the Hotel in Hospet. Morning proceed for an excursion to Hampi – is a world heritage site having the ruins of the Vijayanagar empire. Visit the Vithala Temple – the famous Stone Chariot is located here, Hazara Rama Temple, and the Matanga Hill – from where one can see the most beautiful sun set ever. Later return to Hospet. After breakfast leave by Private Vehicle for Badami, a town famous for its rock cut and other structural temples. Enroute visit to Aihole – a famous temple complex where the Hindu Architecture was born. And also visit to Pattadakal visiting the Virupaksha Temple and Sangameshvara Temple. Upon arrival in Badami check in at your pre booked Hotel.Afternoon visit to the Sandstone Cave Temples in Badami. Overnight stay at the Hotel in Badami. After breakfast leave by Private Vehicle for Bijapur, a city famous for its ancient and historical monuments of architectural importance. Upon arrival in Bijapur check in at your pre booked Hotel. Afternoon city tour of Bijapur visiting Gol Gumbaz – the Tomb of Mohammed Adil Shah, Malik-e-Maidan – the world’s largest medieval cannon, Barakaman – a mausoleum of Ali Roza built in 1672. Overnight stay at the Hotel in Bijapur. After breakfast leave by Private Vehicle for Hyderabad, also known as ‘City of Pearls’ and ‘City of Nizams’. Enroute visit to Gulbarga Fort, Royal Tombs and Jama Masjid. Upon arrival in Hyderabad check in at your pre booked Hotel. Overnight stay at the Hotel in Hyderabad. Morning proceed for the city tour of Hyderabad visiting Charminar – the major landmark in Hyderabad with four graceful Minarets, Golconda Fort – one of the most wonderful fortress in India built on a hill on one side and spiralling fort on the other, Salar Jung Museum, Taramati Baradar and Chowmahalla Palace. Today you are transferred to Hyderabad International Airport to board Flight for Onward Journey. Golkonda Hotel Hyderabad is located at Masab Tank in Banjara Hills. It offers free Wi-Fi and parking and has a restaurant, bar, outdoor pool, fitness centre and a 24-hour front desk. Rooms are air-conditioned and equipped with a cable TV, minibar and coffee/tea making facilities. Hotel offer 141 Rooms. The Melange and The Jewel of Nizam restaurants at Golkonda Hotel Hyderabad serve both local and international dishes. Guests can also enjoy a drink at the Zanzi Bar. The Golkonda Hotel Hyderabad has an outdoor swimming pool, and provides BBQ, as well as laundry and dry cleaning facilities. Airport shuttle is available. Golkonda Hotel Hyderabad is 21 km from the Rajiv Gandhi International Airport. Malligi is equipped with a blue lagoon pool where the guests can enjoy the city’s tropical weather. The property also offers free Wi-Fi. Hotel offers 100 rooms. An ideal gateway to the world heritage site of Hampi, Hotel Malligi is 32 km from Tornagallu Domestic Airport. It is just 3 km from Hospet Railway Station and a 5-minute walk to Hospet City Bus Station. Guests at Malligi can enjoy a traditional massage, or pamper themselves at the spa. A 24-hour front desk can assist guests with laundry/ironing services, room service, car rental services. The hotel also houses a fitness centre. Elegant air-conditioned rooms are equipped with a TV, desk, wardrobe and tea/coffee making facilities. En suite bathrooms include shower facilities and free toiletries. Guests can dine at 2 dining options – Temptations, which serves Indian, Chinese and international cuisines as well as Blue Mist, which serves South Indian dishes. Located in the coffee district of Karnataka, this hotel offers rooms and cottages with garden or pool views and free Wi-Fi access. Housed in a restored colonial building, it features a spa and a gym. Hotel Offers 28 Rooms. Surrounded by gardens, The Gateway Hotel KM Road is 35 km from Kadur Railway Station and 156 km from Mangalore Airport. Drivers can park on the hotel premises for free. Fitted with tiled flooring, the spacious air-conditioned rooms and cottages at Gateway Hotel offer a daybed, tea/coffee making facilities and a minibar. In addition to satellite TV, a private bathroom and a personal safe are also provided. Peaberry offers a casual dining experience, serving buffet spreads of Indian and European dishes at lunch and dinner. Alternatively, drinks can be enjoyed while playing a game of pool at Mukwada Bar. Room service is available. Offering ultimate luxury and excellent services, the Badami Court Hotel makes your stay a truly memorable one. Located centrally and close to the railway station, this hotel offers easy access to all the tourist places in Badami. All the 27 guestrooms at this hotel offer the finest amenities and assures you complete luxury and comfort. The onsite restaurant serves a variety of delectable food for you to savour, in a casual atmosphere. At leisure, you can visit the famous cave temples, the Archaeological Museum, Bhutanatha temples near Bhutanatha lake and other attractions of this city.